Beirut, Lebanon (CNN) -- Air traffic controllers in Lebanon were telling the pilot of an Ethiopian Airlines flight to change course shortly before it crashed into the sea, the country's transportation minister told CNN Tuesday. An international search team was combing Lebanon's Mediterranean coastline for signs of life Tuesday amid fears that all 90 people aboard the Addis Ababa-bound airliner perished in the accident, authorities said. Lebanese Transportation Minister Ghazi al-Aridi said Tuesday it was too early to determine whether pilot error had caused the crash. He said the plane's flight data and cockpit voice recorders would need to be recovered to determine why Flight 409 disappeared from radar screens shortly after taking off from Beirut's Rafik Hariri International Airport at about 2:30 a.m. local time. The control tower lost contact with the plane before it made a course correction Monday, al-Aridi said. In a statement, Ethiopian Airlines said the pilot of the flight had more than 20 years of experience flying various aircraft with the airline's network. The plane had been declared safe and fit to fly following a regular maintenance service on December 25, 2009, the airline said. 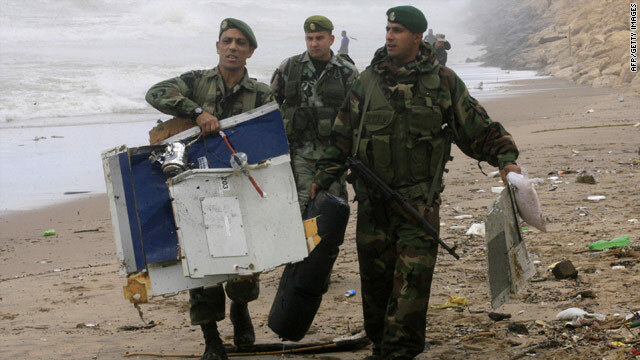 The Lebanese military reported Tuesday that 14 bodies had been found -- nine fewer than an earlier count. Confusion early in the search led to double-counting, they said. No survivors have been found. The U.S. National Transportation Safety Board is also sending an investigator because the plane was made by a U.S. manufacturer. The plane crashed about 3.5 kilometers (2 miles) west of the town of Na'ameh which is 15 kilometers (9 miles) south of Beirut. And in September 1988, a flight struck a flock of birds during takeoff. During the crash landing that followed, 31 of the 105 people aboard died. CNN's Nada Husseini and Cal Perry contributed to this report.